In advanced settings -> SIP/RTP -> “SIP Session Timer” needs changing to 90. If you would like more granular control of the features of the SNOM handset you can manually provision the phone using its web interface. These settings were tested by Forza IT using the SNOM 300 on the 8.4.32 version of the firmware. 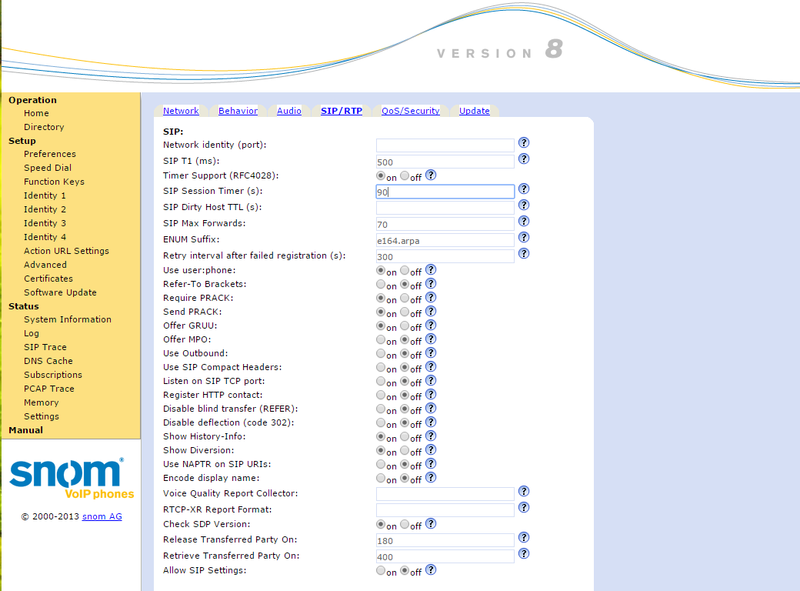 Simply browse to the phone IP address and use the settings shown in the pictures below. However, babblevoice have used these same settings on a SNOM 760 and it works. 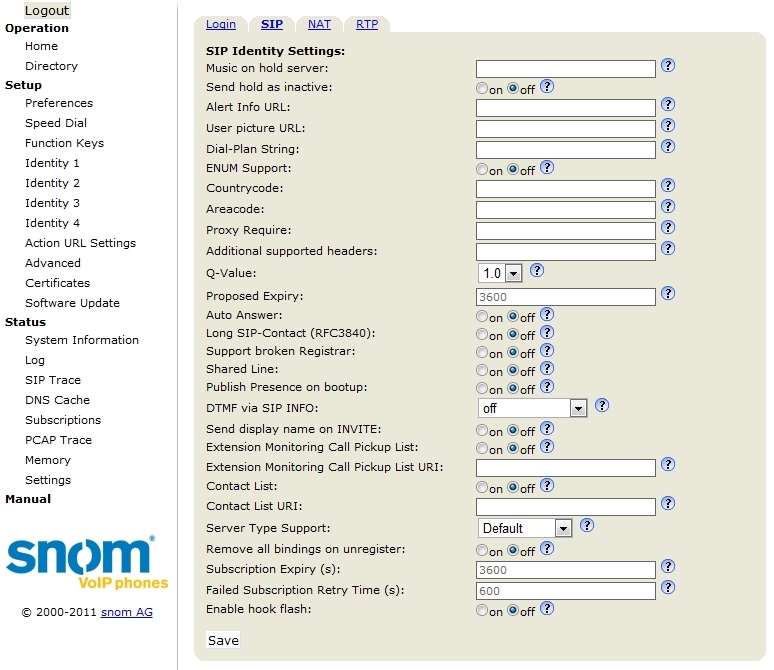 Then you will be greeted with the web interface of the Snom, once inside you should select “identity 1” from the left hand side. - a.Make sure that the Identity is active. b.The display name could be anything you would like perhaps the owner of the or the extension number. c.In the account section enter your extension number for an example 1000 is the extension number therefore the account. d. In the password section enter your Babblevoice “secret” e. under registrar and outbound proxy please enter your domain name e.g. 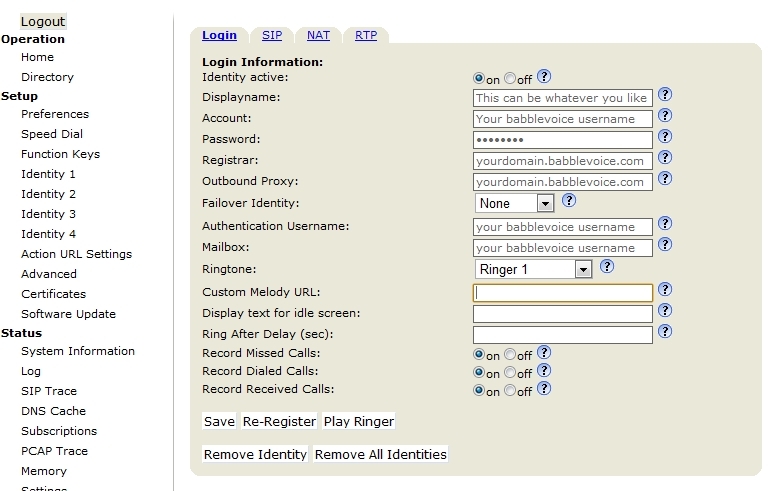 omniis.babblevoice.com f. Authentication username and mailbox both need to be filled in like the account section above e.g. the extension number. Select Save and make sure all the settings have successfully saved. Restart the phone and test by making a call in and out. identify the IP address of the phone a. once again go to the settings menu and select “system info” inside this will show you the IP address. Open the web configuration page by opening a web browser and typing the IP address of the phone. 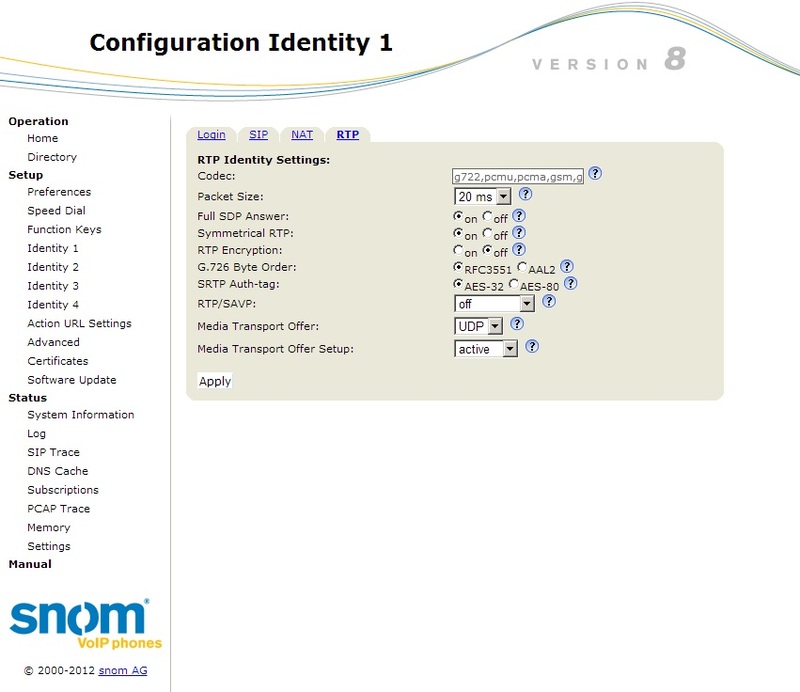 Once you have access to the web configuration page select “identity 1” from the list on the left hand side a. Once inside this menu you will see the details in which need to be filled. Select Indentity active to on Choose a display name - this can be anything you like, this will be displayed on the phones background Account - in this section enter the babblevoice extension you would like it to be configured to under registrar and outbound proxy please type in “yourdomain.babblevoice.com” authentication name - this is your extension number once again Password- enter your secret from your babblevoice dashboard. Once you have completed this the Snom should then register to babblevoice and is ready to be used. This is a useful device for loud speaker situations. You can either connect speakers directly to it or use the line out to drive an external amplifier. Once done it is also wise to change the default password - as a rule set this to the device username secret from babblevoice. This means you will not forget it.